Thanksgiving math activities are easily incorporated into this family-oriented holiday. Use selected math activities to keep skills sharp over holidays by giving them to kids before they go home for Thanksgiving break. Or, if you are a parent, make up your own learning packet for your kids to help them get in some extra practice. 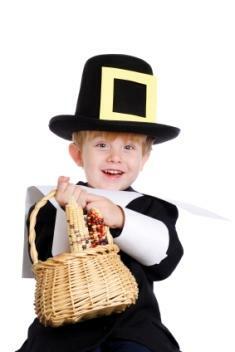 When you think of Thanksgiving Day, you probably think food, family, and fun. Thanksgiving is certainly an enjoyable time of the year, but it can be an educational one as well. Whether you are a teacher or simply a parent looking for ways to reinforce your child's math skills, Thanksgiving math activities are easily incorporated into this yummy holiday. The following suggestions can be modified for children of different ages. In addition, you may want to adapt these lessons into your own celebration. Kids love to feel like they are doing their part, so why not let them help you plan your Thanksgiving meal menu? Together you and your child can make a list of foods that will be served at the dinner. Next, list the ingredients you will need to make each food. Hand your kids newspaper ads that typically come out the week before Thanksgiving. Have them circle all the foods and ingredients they can find in each grocery advertisement. Now, have them search for the cheapest price in each ad, and them place a star next to that designated sale. See who found the most "deals", then head to the store and purchase the foods you need. As an added exercise, have kids double each recipe you make and write down the new measurements for each ingredient correctly. Turn Thanksgiving meal planning into a competition for your kids! Hand out a specific amount of play money to each child. Be sure they all get the same amount. Create a list of favorite family Thanksgiving foods together. Now, instruct them to create a budget and "purchase" everything they need to make a well-balanced Thanksgiving meal. They can get prices either off the Internet for local grocery stores or from local grocery ads. Ask kids the following questions, and see how well they use their math skills to find the answers. In some cases, they may need to use graphs. If a turkey should be cooked 20 minutes for every pound, how long will a 16 pound turkey need to be cooked? If each person eats one-fourth pound of turkey, and there are 12 people who are coming to dinner, how large should the turkey be? What percentage of a turkey is white meat and what percentage is dark meat? How many people ate white meat, dark meat, or both at dinner? Using card stock or construction paper, cut out a turkey. Affix Velcro to the feathers and add real feathers that can easily be removed. Have kids count how many feathers the turkey has, or teach addition and subtraction by adding and taking away varying amounts of feathers. Let children create macaroni necklaces by stringing uncooked macaroni. Ask kids to count how many macaroni pieces are on each necklace. Print out Thanksgiving math worksheets, and encourage kids to practice their math skills while you are cooking in the kitchen. Incorporating math activities into holiday celebrations is quite easy to do, and your kids won't even know they are learning simply because they are having so much fun!